The events in Odessa and the Donetsk region over the past three days mark a new stage in the Ukrainian drama. The authorities in Kiev are ready to use indiscriminate force, their Western mentors are supporting them while continuing to blame Russia for the rampant violence, the insurgents in the east appear to be on the defensive, and Vladimir Putin, somewhat unexpectedly, seems uncertain of what to do next. The strategy of the interim regime in Kiev, evidently acting on the advice from Washington, is to abandon nonviolent counterinsurgency (which in any event has never been tried) and to provoke an outright Russian military intervention. From the viewpoint of the interventionist duopoly in Washington and its protégés in Kiev this would yield multiple benefits. It would give a belated boost to NATO, lead to the establishment of permanent U.S. bases along its eastern flank, and result in the deliveries of lethal weaponry to the interim government. It would thus reestablish Washington’s hegemony in Europe to a degree unseen since the Cuban Missile Crisis, while entangling Russia in a potential quagmire with no clear exit strategy and, for good measure, reducing Brussels to the position of a mere rubber-stamper. To paraphrase Victoria Nuland, the EU would be terminally f…ed. 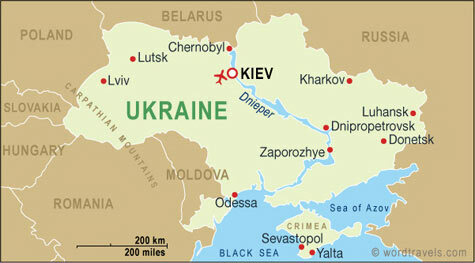 The Kiev authorities also hope that a Russian intervention would enhance their control of the country by promoting anti-Russian sentiment in central Ukraine – a large area south of Kiev, west of the Dnieper bend and east of Vinnytsya – which traditionally has not been strongly nationalist or Russophobic. The immediate objective is to produce the Gleichschaltung in advance of the presidential election scheduled for May 25, which key Western leaders insist should go ahead regardless of the mayhem in the east and south – even though it will be plainly illegitimate. Their candidate of choice, an arch-oligarch by the name of Petro Poroshenko (the “Chocolate King”), is a nasty piece of work: a robber-baron steeped in the nationalist ideology that reeks of Europe of the late 1930’s. Poor Yulia Tymoshenko, still imagining she’s the darling of the West. No, dear reader, mark my words: Poroshenko is Washington’s choice, just as “Yats” was Victoria Nuland’s designated “prime minister” three months ago, and duly got the post after the February coup. What happens in Kiev will reflect the will of the White House and the State Department, because what is quaintly called in the Western media “the government of Ukraine” has even less control over its affairs than the government of the German Democratic Republic under Walter Ulbricht. Last winter, while quietly bankrolling the Galician storm troopers, Poroshenko remained on the sidelines of the mayhem. Now that he is being lionized in the West as the future savior of Ukraine, it is worth looking at his program as stated in his own words. It is the Maidan on steroids. Poroshenko insists that the Constitution will not be changed during his presidency; no devolution, no autonomy: “Ukraine will remain... a unitary state.” If he becomes president, Russian language will be banned in all official communication: “I will act on Article 10 of the Constitution, which defines Ukrainian as the state language... With a view to securing the unity of the Ukrainian political nation, the existing status-quo regarding the language issue must be preserved.” There is no “Ukrainian political nation,” of course, united or otherwise, but Poroshenko’s assertions are a direct challenge to the east and the south. It is tantamount to saying that only French can be used in the Flemish regions of Belgium, or that the cantons of Fribourg, Ticino and Geneva have to learn German. On the other hand, the lack of coordination of the eastern insurgency reflects its home-grown character and its members’ unclear, even disparate objectives, as depicted in a major New York Times feature on May 5. Had the Russian officers and special forces units instigated, armed and led the insurgents, as still alleged by Obama, Kerry et al, there would have been a clear command and control structure in place and far more professional groundwork. The roads connecting Slavyansk, Kramatorsk, Donetsk, Lugansk, and other foci of rebellion would have been blocked and mined. This is not the case. Makeshift barricades manned by lightly-armed men on the outskirts of those cities are separated by many miles of unguarded countryside, giving Kiev’s forces some considerable freedom of maneuver. To conclude: If Putin does not act, he will be discredited and seen as weak. If he does, he will be further demonized and sanctioned. Since he has already been Hitlerized ad nauseam, and since allowing the Galician storm troopers to wreak havoc in the east is simply intolerable, he should act – but prudently. Declare a no-fly zone over eastern Ukraine, cynically invoking the nebulous “Responsibility to Protect” doctrine for a touch of black humor. Shoot down anything that flies. Send company-sized special forces on a series of hit-and-run missions to even the playing field, without occupying the land. Do what he is already accused of: arm and train the self-defense units, and give them some competent staff officers. Ukraine is a pathetic non-country with lots of nasty people with guns, a failed state that could have made something of itself until last fall. Western meddling has turned it into a Hobbesian nightmare, and Russia’s response has been inadequate and incoherent. Putin needs to get his act together, not only for his country’s sake, but also for ours. You need not agree with Pat Buchanan that “he is one of us” to see the catastrophic consequences of allowing the Duopoly to do its thing unopposed in the most geopolitically significant region of Europe. There is no saving Kiev's government after the Odessa Massacre. Poroshenko might not be a contender very soon either if rumors of his involvement keep spreading. Russia should fight at the UNSC and get permission there, even if the regime keeps committing atrocities, unfortunately. Europeans are not going to plunge their economies into the dark ages over more "yellow cake" rumors. I wonder if Dr. Trifkovic has seen the videos of what happened in Odessa. What I saw was unarmed soccer fans getting shot at and killed by a pro-Russian group. When it became clear to the incredulous crowd that the police were actually protecting the attackers, they simply did the logical thing, i.e., defend themselves. This hardly constitutes indiscriminate force directed by Kiev. John, Do you even know which side is which? The "unarmed soccer" fans were the ones shooting guns at people trying to escape the burning building. And how could they be the attackers since they were the ones who set up tents in the field? In the videos, the ultras are the ones streaming towards them like ants. Mr. Trifkovic, I have great respect for your scholarship and agree with a great deal of your writing. I was very vocal in my opposition to America's actions against Serbia in the 90's. I also agree with you that Russia has some legitimate complaints about American meddling and attempts to add Ukraine, Georgia, etc. to NATO. What I find unbelievable is the idea that the United States, a country that values racial, religious, and cultural pluralism above all else is helping to set up the Third Reich in Kiev. Tymoshenko is part Jewish. Victoria Nuland likewise. I can't see them as big fans of Stepan Bandera. Again, since Arseniy Yatsenyuk seems hand picked by Nuland, why would she put in power a new Bandera? This neo-Nazi government in Kiev is the part of the story I'm having trouble with. Can you help me with this? Dan, you need more complete information. The story begins with the soccer fans of Odessa and Kharkiv(!) singing patriotic songs together in a show of unity for Ukraine before the game, in Sobornaya Square. That's where the violence begins, not at the Trade Union building. Pro-Ukrainians are the first victims. From what I can gather, the separatists' tents were full of guns and molotov cocktails. Surely the pro-Ukrainians were happy to make use of those on their assailants.